Two months ago, the Food and Drug Administration launched a campaign of "shock and ewww!" against America's tobacco companies. Beginning on September 22, 2012, the FDA will start slapping anti-smoking posters across the top half of every cigarette pack in the nation. These are shocking, disturbing pictures -- pictures of smokers breathing through tracheotomy holes in their necks, of a mother cradling her baby in a haze of tobacco smoke, of a cadaver lying on an autopsy table. The graphic anti-smoking campaign is designed to prove that a picture is worth more than 1,000 words of small-print nagging. However, last week, some of America's biggest tobacco companies banded together to sue the FDA, alleging that this latest campaign goes beyond simply helping consumers make a more informed decision about whether to smoke. Whether or not the tobacco companies succeed in blocking the FDA's new pictorial anti-smoking campaign, the writing's on the wall for this habit: The embers are burning down on smoking in America. The new campaign promises to effect the government's aim of rolling back the smoking habit in the U.S. until less than 12% of the population lights up. But while the end is admirable, the government may be using the wrong means in this particular case. Requiring the companies to "speak" so graphically against their own self-interests, the companies say, effectively violates the Constitution's First Amendment guarantee of freedom of speech. It fundamentally "abridges" that freedom by dictating to companies what they must say and how they must say it. The tobacco companies say this is unconstitutional ... and they may be right. 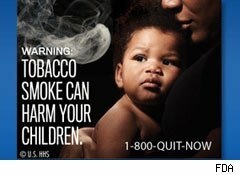 Swaddling tobacco packs in graphic anti-smoking propaganda may be the best way to reduce the incidence of smoking in the U.S. Around the world, countries from Australia to Brazil to Venezuela have begun taking the Technicolor warning label approach. On the other hand, in some countries, the main effect of introducing pictorial warnings on cigarette packs has been to encourage the sales of picture-free cigarette cartons, pack-covering cigarette cases, or novelty stickers that cover up the warnings. One clever lad in England was spotted covering up his smoking-might-kill-you label with a sticker responding "You could be hit by a bus tomorrow." So clearly, even this new FDA push is not without its flaws. But you can still understand why the government is making it. Up until 1966, the U.S. government did not require any health warnings on cigarette packaging. 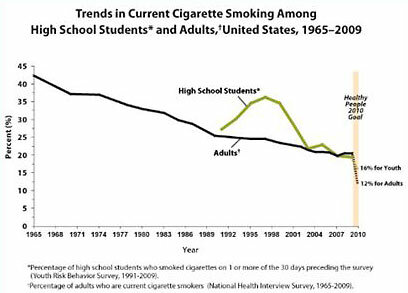 The year before the first warnings went into effect, 1965, CDC estimated that 42.4% of American adults smoked. Then began a five-year campaign in which tobacco companies were required to place the following warning on their packaging: "Caution: Cigarette Smoking May be Hazardous to Your Health." Result: a 5% decline in the national smoking rate (or one percentage point per year). In 1970, the government stepped it up a notch, requiring the more definitive "Warning: The Surgeon General HasDetermined that Cigarette Smoking is Dangerous to Your Health" label (emphasis added.) This campaign lasted 15 years, and helped drive smoking rates down another 7.3 percentage points, to 30.1%, roughly half a percentage point per year. "Smoking Causes Lung Cancer, Heart Disease, Emphysema, And May Complicate Pregnancy." "Smoking By Pregnant Women May Result in Fetal Injury, Premature Birth, And Low Birth Weight." And for the chemists out there: "Cigarette Smoke Contains Carbon Monoxide." 24 years of such warnings succeeded in subtracting another 9.5 percentage points from the smoking rate. (About 0.4 points per year.) Even so, by 2009, (the last year for which figures are available, still slightly more than 1 in 5 Americans were still puffing away. As I see it, there are two ways to look at these trends. On the one hand, you can say past efforts to inform smokers have yielded diminishing returns. Once folks have been told that smoking is bad for them, telling them the same thing again doesn't make them any more informed, or more likely to quit. Hence the government's desperation to "step it up a notch." On the other hand, even if the tobacco companies successfully block the FDA's graphic anti-smoking campaign, a trend is already in motion. People are quitting. They may simply not be quitting as fast as the government would like. Motley Fool contributor Rich Smith does not own (or short) shares of any stock named above, but The Motley Fool owns shares of Altria Group. The Motley Fool has a disclosure policy.